In recent decades, changing dietary recommendations have left many consumers wondering, “Are eggs healthy?” While that’s understandable, the truth is that eggs are good for you regardless of your age. Eggs can enhance fetal development in pregnant women, for example, and they can preserve brain function in older people as well. One large egg has just 70 calories, including the nutrient-rich yolk. A large egg has only 4.5 grams of fat, including 1.5 grams of saturated fat. One large egg represents 13 percent of the U.S. Recommended Daily Allowances for protein consumption. Eggs are low in sodium. Eggs naturally provide key vitamins and minerals, such as folic acid, vitamin B12, iron, zinc, calcium and vitamin D.
Put simply, eggs naturally contain just about every nutrient humans need to be healthy without packing a lot of calories. Eggs like Sauder’s Gold Eggs, which are enhanced with added nutrients like Omega-3 fatty acids, lutein and vitamins, offer even more nutritional value. Hens that eat Sauder’s Gold Feed lay our Gold Eggs. Gold feed is our unique vegetarian blend of all-natural ingredients — there are no hormones or antibiotics. Sauder’s Gold Feed gives these eggs a boost of important nutrients — omega-3 fatty acids, lutein, and vitamins D and E. Conventional eggs also have these key nutrients, but Sauder’s Gold Eggs have more. Thanks to Gold Feed, Sauder’s eggs have another level of nutritional value compared to other eggs and are the perfect food. So why are higher levels of these nutrients so important? Each of these nutrients — omega-3, lutein, and vitamins D and E — all have important health benefits. Omega-3 fatty acids are not made by our bodies naturally, but this nutrient is an important part of our diets and health. To get the necessary omega-3s your body requires, you have to specially seek out foods with it or take supplements. When you include Sauder’s Gold Eggs as a regular part of your diet, you get a great source of omega-3 without having to buy expensive supplements. Omega-3 can help prevent chronic diseases like heart disease, arthritis, and cancer, as well as improve circulation. Lutein, another nutrient found in our eggs, helps improve eye health and can help prevent certain diseases, like colon cancer, breast cancer, and type 2 diabetes. Then there’s also vitamin D that makes bones and teeth stronger. In addition to providing the highest-quality eggs, we also want to keep our negative impact on the environment as small as possible. As a step in our desire to be as sustainable in our practices as we can, our Sauder’s Gold Eggs are packaged in our eco-friendly GreeNest cartons. Half of these cartons’ materials come from all-natural grass fibers that have never been touched by fertilizers or pesticides. They are recyclable, home compostable and biodegradable. Our GreeNest cartons have helped us reduce our carbon footprint by 10% in our production methods. Any changes, no matter how small they seem, can have big impacts. We only have one Earth to call home — Sauder’s Eggs wants to do its part in helping keep it healthy for future generations. Increased HDL Levels: HDL is shorthand for high density lipoprotein, which is widely referred to as the “good” kind of cholesterol. As a general rule, individuals with higher levels of HDL are less susceptible to suffer from heart disease, stroke and a variety of other maladies. Eating eggs is an effective way to increase your HDL level. In fact, one study showed that consuming two eggs per day for six weeks can raise HDL levels by as much as 10 percent. Eggs Transform LDL Cholesterol: Whereas HDL is the good cholesterol, LDL cholesterol is the bad kind. LDL cholesterol has several subtypes that are related to the size of its particles. People whose LDL cholesterol consists of mostly small particles are more vulnerable to experiencing heart disease than people whose LDL cholesterol is largely made up of larger particles. Eggs have the power to transform small, dense LDL particles into large particles, which can reduce your risk of heart disease. Eggs Preserve Eye Health: Many people experience worsening eyesight as they age. Luckily, eggs contain several essential nutrients that can help preserve the health of your eyes, including lutein and zeaxanthin. Eggs also contain vitamin A. Vitamin A deficiency is the leading cause of blindness throughout the world. Despite all the benefits of eating eggs, many people refrain from eating them due to the assumption that they are too high in cholesterol to fit into a healthy diet. This was especially true in the 1940s, when health professionals advised the public to limit their cholesterol intake to lower their risk of heart disease. Specifically, they warned the public not to consume more than one egg a day. But in 2000, the American Heart Association officially deemed eggs safe — and actually very healthy — to eat. With zero grams of carbs and sugars and six grams of protein in the average egg, you can get a hearty, energy-boosting breakfast without the unnecessary ingredients or worries. Eggs contain all nine essential amino acids, making them a complete protein. This makes them a great option for anyone who is vegetarian or follows some other diet that makes it difficult to get enough protein. Color has no effect on egg nutritional benefits, so brown and white eggs have the same health advantages. At the end of the shell-making process, brown eggs just receive an additional pigment. To support the growth and development of their babies, pregnant women must consume more of certain vitamins and minerals, such as Choline, Omega-3s and folic acid. An average egg contains about 250 milligrams of Choline, 160 milligrams of Omega-3s and .25 milligrams of Folate. With the amount of proteins, nutrients and vitamins in a classic egg-based breakfast — such as two eggs, some fruit and a slice of whole wheat toast — you will feel full for several hours after your morning meal. Eating eggs for breakfast is an efficient way to fight off those pre-lunchtime munchies. Egg White: The white of an egg contains roughly 17 calories, zero grams of fat and more than half of the egg’s total protein, potassium, riboflavin, magnesium and sodium. It also makes up about 66 percent of the total weight of the egg. Egg Yolk: In the center of the egg white is the yolk, which contains about 55 calories, all of the egg’s fat content and the entire portion of Vitamins A, D, E and K. The yolk accounts for roughly 34 percent of the egg’s total weight. 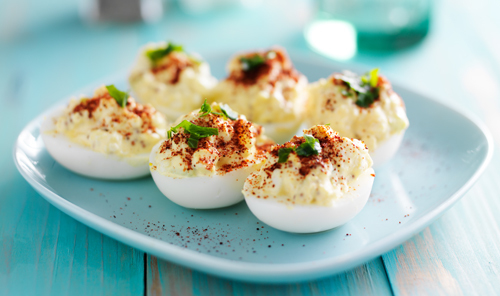 If you’re looking for ways to cut fat from your diet, try enjoying egg whites without the yolks. You can then use the yolks in salad dressings or for a creamy hollandaise sauce on special occasions. Or, simply enjoy a good old-fashioned traditional egg. It’s still great for you, even with that tasty yolk! One of the great things about eggs is the number of ways you can prepare them — we’ve thought of 13, and we’re sure more methods are out there, too. Of course, the way in which you cook your eggs has an effect on their nutritional value. To best maintain the nutritional integrity of your eggs, you should opt for a fat-free cooking method such as hard-boiled, soft-boiled or poached. That doesn’t mean you have to give up your over easy or scrambled dishes, though — just know that adding cooking spray or oil will add a little bit more calories and fat to your meal. The answer to this question is, it depends. For example, Omega-3 and pastured eggs can lower triglyceride levels successfully. Hens raised on pasture and those raised on feed rich in Omega-3 have higher levels of Omega-3 fatty acids. Omega-3 fatty acids lower triglyceride levels, thereby reducing the risk of heart disease.In a study published by the Journal of Nutrition, eating an egg a day did not affect participants’ blood levels of total cholesterol, HDL cholesterol, LDL cholesterol or triglycerides — however, their levels of lutein and zeaxanthin, two nutrients for carotenoid protection, did increase. High blood cholesterol levels and high blood triglyceride levels commonly occur simultaneously, but your triglyceride level does not increase with consuming dietary cholesterol. Is it true that eating eggs can increase my risk of heart disease or stroke? This misperception was perpetuated for decades simply because eggs contain cholesterol. Recent studies have discovered no relationship between eating eggs and a greater risk of heart disease or stroke in people who don’t suffer from diabetes. Can eating eggs help me lose weight? Eggs are loaded with protein, which is a filling macronutrient. Because of this, eggs rank high on the Satiety Index, which measures how effective foods are at making people feel full after they’re consumed and reducing their subsequent intake of calories. One study revealed that eating an egg breakfast instead of a bagel breakfast over eight weeks resulted in a significant amount of weight loss. Is it safe to eat the yolk? Absolutely! In fact, the yolk contains the majority of an egg’s nutrients. How many eggs can I eat in a day safely? It’s widely accepted that people can eat three eggs per day if they’re trying to stay healthy. While there is no evidence that eating more eggs in a 24-hour period is harmful, no one has conclusively studied the effects of eating more eggs on a daily basis to date.. This brief list of FAQs is far from exhaustive. It simply gives you an idea of the kinds of inquiries we field on a regular basis. If you have questions about our products or eggs in general, we encourage you to contact our family-owned and operated organization today! With eggs being such an affordable source of protein compared to many alternatives such as beef and a lot of fish varieties sold in grocery stores, the egg industry in the United States remains strong. According to the American Egg Board, table egg production in the U.S. reached a total of 7.67 billion in October, 2017 alone. As of November, 2017, the per capita consumption of eggs in the U.S. is expected to be 275.2 million in 2017, which is up from 274.7 million in 2016. Since eggs offer such rich nutritional value and so many meaningful health benefits, it’s no wonder why the egg industry in America is thriving. At R.W. Sauder, we’re proud to be a part of an industry that sells products people can feel great about consuming every day. To learn where you can buy Sauder’s Eggs at affordable prices, use our helpful store locator now!